Can I just say, in advance, that I think the last week has proven to be one of the most momentous of my life? I suspect that's not going to stop, just yet, but I thought I'd pause from the pile of pre-press work I'm on for a brain break and update on the painting. Chronologically: finished up painting around 3 AM Monday night (Tuesday morning? ), and actually managed to get in bed for a four hour sleep/nap. The last bits to paint ranged from easy (nailed a teeny tiny sliver of wood to the bottom to correct a bad angle, blend with the rest of the painting as well as possible) to difficult (try to make the nose happen), to the complete unknown (insert mathematical symbols on the wall as a pattern, find somewhere to put a dog in the painting). and then a quick trip to show my mother, as promised, then off to work while Dad overnighted to Bowling Green, Kentucky. 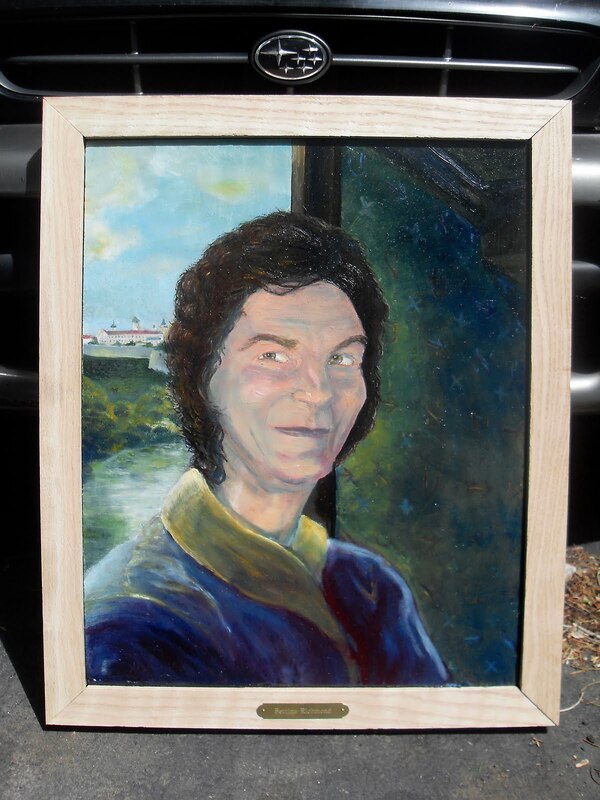 The painting got there in time, and (although I haven't heard), I imagine it was included in the memorial service. I plan to drive down to varnish it sometime in the Fall. "I think the most impressive thing is that there is a lot of life and character to the piece as a whole. I really sense her personality coming through. Did you photographic it with a flash? It looks like there is a lot of reflection in the photo (I assume there weren't white dots on the painting..) I see a lot going on with the skin tone, especially with warm and cool. It looks like you could push light and dark as well as warm and cool on your next attempt that would create even better results..."
I did want to bring out lights and darks more on the face, but the earlier drafts looked too heavy, and I decided that having her too much in shadow would be kind of morbid. 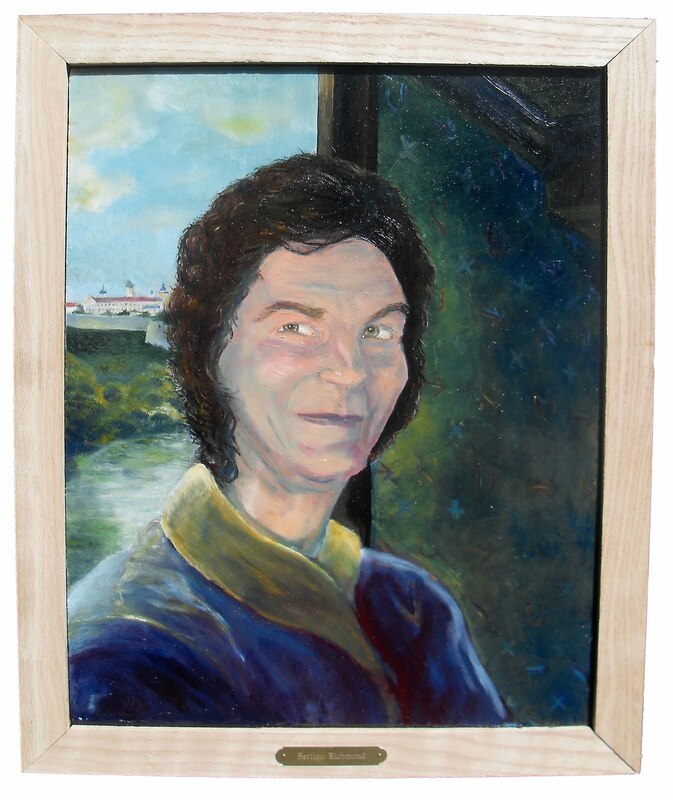 Unlike the watercolor portrait, this one had the extra added challenge on capturing her likeness. No single photograph sent felt right, so the final ended up being a composite - tracing or gridding wasn't an option. I spent more time moving the nose around - it's amazing how much difference just a tiny amount of paint can make. Particularly dispiriting was the neanderthal phase, where her brow ridge became lumpy and highly prominent. 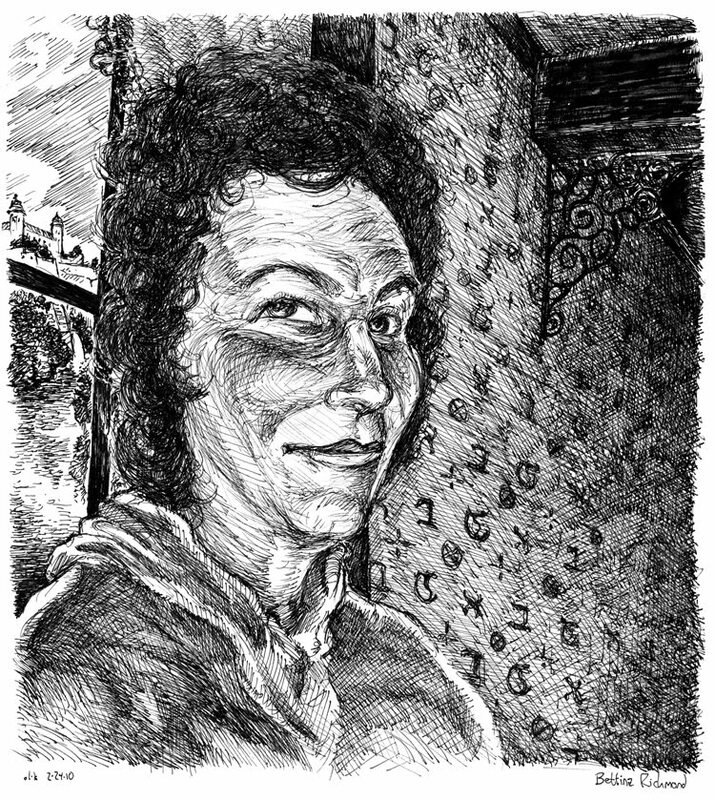 I was kind of gun-shy with this one, given both the context and thinking about issues with my previous oil painting, the portrait of Yesenia from 2007 - that one just looks much too cartoony for me, and I recognize that the noir chiaroscuro effects that I've developed over the years in pen and ink don't translate at all to paint. Really, it's all about trying to sublimate my style as much as possible. I've wanted to work in a naturalistic mode for some time. I can do do somewhat easily in watercolors, which (despite their unforgiving nature) are made for achieving subtle effects through layering. I'm still fighting that in oils, erring on the side of too 'illustratory' or, conversely, far too minimal. But if I haven't said it enough, glazes on panel seems to be a way through. There are still a whole host of technical issues to work out with the process - it becomes gummy and thick and impossible to work with sudden quickness; blue pigments don't cover well and instead bead up in the medium; it collects dust like a goddamn air purifier; and it remains viscous for days on end, meaning that an early underpainting melted grotesquely for days. I eventually took to leaning the desktop easel back to about 30º and putting a barbel weight at the base to prevent it from tipping while working, and then lying it flat on the floor between sessions. Where it, of course, attracted even more dust. I'm probably going to try a little en plein air with this during the summer - a good exercise to focus on color and temperature without having to worry about whether or not I've done honor to the spirit of a dead woman in a portrait made for her husband." but I was up against a lifetime of difficulty in oils, and, even though I didn't quite break through the wall with the medium, I think I was able to push it back a bit. I realize that the entries on this have probably read as terribly dry and wonky - there can't possibly be anyone who wants to read about this to the extent that I've felt the need to write about it - so thanks for reading, if you have, and I promise the next few Ramblers will be light and airy.